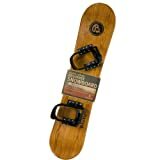 Lucky Bums Heirloom Collection Kid’s Wooden Snowboard (95-cm) – SkiChild – Snow Skiing and Waterski for Kids. Ski Product Deals, Reviews, Travel Deals and more. The handmade Heirloom Collection Wooden Snowboard is just cool! The modern design of snowboards with the classic construction of wood is combined to offer a fully functional snowboard complete with premounted adjustable bindings. It is a great beginner snowboard to introduce kids to snowboarding in the back yard or on the nearby sledding hill. The 95 cm long board has no metal edges and is ideal as a holiday gift for the first time snowboarder or as decoration for the cabin wall. Limited lifetime warranty against material or workmanship defect.